This unit circulates air away from equipment protecting it from heat and heat related failures. Simply place the unit on top of equipment or mount it to the back of a cabinet to pull air out and away from components. It is perfect for cable and satellite receivers or larger components where heat is a concern. 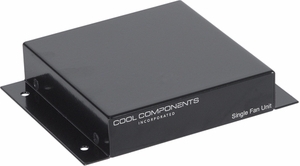 The cooling unit is constructed from heavy gauge steel which is extremely durable (ideal for pro sound applications), but it also acts as a large heat sink increasing the efficiency of the unit. A top-quality levitation blower uses a floating gasket to eliminate noise. The unit operates on DC voltage and by adjusting the voltage can be run virtually silent or more aggressively depending on the application. Uses the universal power supply (included). Dimensions: 5-1/8" W x 1" H x 4" D.